When refugees come from South Sudan, they have to register themselves at a government office. They will be given a plot of land about 30 by 20 meters where they can cultivate their own crops to sustain themselves. They either buy their seeds or receive them from a NGO. My overall impression of the refugees is that there has been so much help from the Ugandan government, Ugandans, and NGOs that their lives look normal. The refugee camps are like villages. People take care of people. Most people live in huts or brick huts similar to the indigenous Acholi people. 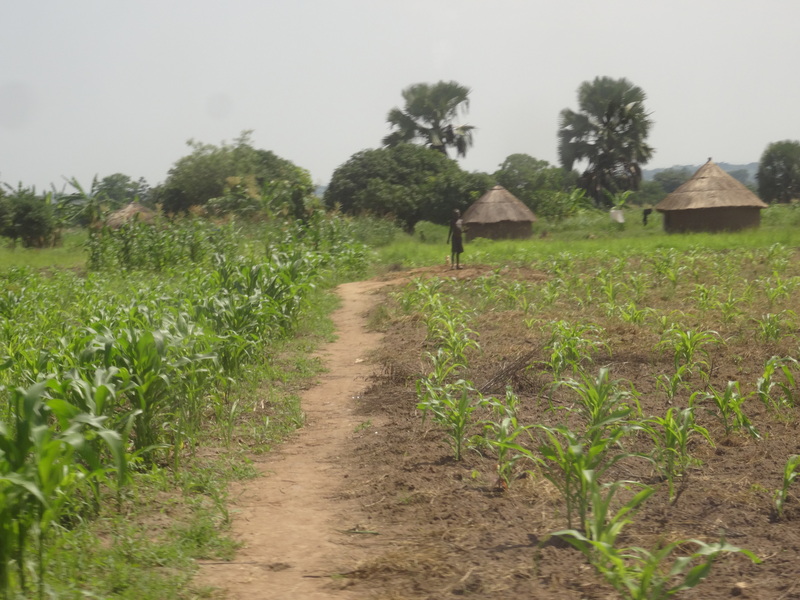 They have a tiny amount of land compared to the local people, but for most refugees it is sustainable and allows for other refugees to have land. Food can be supplemented by NGOs, and money obtained from doing other activities. Water is free since it can be pumped from the ground using wells. There are really old cars here and a lot of motorcycles. They have freedom of movement and can even get jobs. Phones give a lot more opportunity to people in Uganda. They can be used to exchange money. Credit cards and debit cards haven’t taken off like they have in the US. Furthermore, they have radios on them which is awesome since almost every household has access to some form of entertainment and news. Radio stations were first set up by the Anglican Church. Now, in Adjumani, there are 5 radio stations. They have become a source of education and information. Part of their broadcasting is telling people their rights. 80% of those stations are Catholic. The people here are interested in holy programs like preaching or readings from the Bible. The difficulty of life creates this great interest. Faith becomes hope. However, the normalcy is just a veil. The traumatizing experiences will take a lifetime to get over. If they lost a family member or got separated, a full stomach isn’t enough to make one happy. They lost their home and now are in a foreign land. In the background, human trafficking and other nefarious activities happen regularly. Child trafficking is especially terrible (although not that common). Boys are taken back to South Sudan and become child soldiers. Girls are taken back to South Sudan for child marriage. With so many refugees, local essential services like hospitals and schools have been overburdened. Health care is abysmal. Diseases are prevalent. The hospitals weren’t built to accommodate so many people. There aren’t enough beds there. Some people have to lay on a mattress on the ground. The staffing is too low. The maternity ward has one nurse at a time. Regarding schools, there is just too many students. Primary school tries to take as many children as possible. There is a shortage of scholastic materials, though. The shortage is secondary schools is even worse. There is a big drop in between those who continue their education and those who don’t due to the lack of space. Culture isn’t helping. The first born child is usually taken out of school to help around the house. Gender based issues further worsen everything. Domestic abuse is a problem. Men beat women and women beat men. The marital problems don’t stop there. According to the culture, women would go to men for marriage and there would be a dowry. Now, men are going to women which becomes a problem if the men are already married since they are leaving their families. But, the ugliest parts of marital strife happen to women. Early marriage and child marriage stunts women’s intellectual growth. Once married, women have little time to educate themselves since they have to take care of the family. Culture doesn’t help as is the case with wife inheritance. Wife inheritance occurs when the husband dies. His wife must marry his brother even if she doesn’t want to. This makes a lot of relatives kidnappers who want their sisters-in-law to come back so that they can marry them. Women are getting educated and are trying to stop this practice, and Ugandan laws protect them. Despite all the troubles women face, the worst happens to orphans since they are the most vulnerable.